Asthma and allergy rates are soaring but not due to pets, in fact, having a dog strengthens a child’s immune system. No breed is actually hypoallergenic but the European Respiratory Journal reports that a dog can boost the immune system in young children. Dr. June McNicholas states “pet ownership was significantly associated with better school attendance rates.” The 2002 study at Warwick University determined that children with dogs were more exposed and therefore the immune system, being challenged, became stronger. There are several purebred dog breeds that reduce the allergy factor while boosting the immune system! 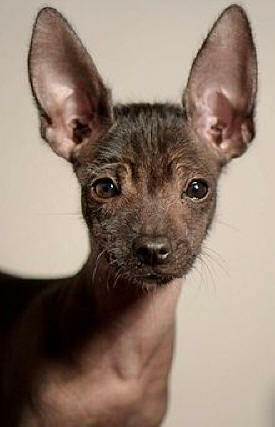 First on the list is the Mexican Hairless, now called Xoloitzcuintli, is also nearly hair and dander-free. From a practical point, the "Xolo", (pronounced Sho-lo) is exceptionally easy to keep free of shedding hair and skin cells. Just wiping with a dust-catcher type cloth usually suffices but for extremely sensitive owners, daily bathing may be necessary. Not so much because of shedding but for the same reason that pillow cases should be changed nightly and dust and pollen filters will be necessary. The American Hairless Terrier which is mostly hairless and dander-free, comes in a variety of skin colors and yes, they often have freckles! The AHT averages under 15 pounds, loves children and can play all day. Talk about bragging rights, your child won't stop talking about his hairless dog! See below for info on the American Hairless Terrier. Always use dog shampoo because dogs have a different ph than people. Note: dry skin is more prone to flaking, whether it’s the dog or a family member… A gel with aloe and vitamin e is advised to keep the dog’s skin from becoming too dry. Avoid multiple ingredient lotions which are expensive and can actually cause allergic reactions. 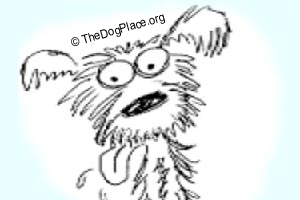 Many Terrier breeds shed very little and the hair is coarse, not fly-away. Poodles and other curly coated breeds “hold” the coat so there’s less loose (airborne) hair to irritate human airways. Unfortunately, all double coated breeds have soft undercoat that “floats” (like cat hair) and that is indeed problematic for people with allergies or breathing problems. “Bull breeds” such as Bull Terriers (Standard and Miniature size) have a very close, tight coat which doesn’t “float” and unlike short-nosed bull breeds such as Bostons, Boxers and Bulldogs, the Mini-Bull has a very dry mouth so saliva should not be a problem for asthmatics. All doctors agree, nothing is better for human health than laughter and, well... you should probably learn more about Mini-Bulls. See link below. So don’t despair if you or your child suffers from allergies or asthma. Choosing wisely, you can probably still have a dog. In fact, a family dog can be your canary because dogs are often allergic to things like dust mites, new carpet and furniture treatments, pest control sprays, etc. and that’s a warning to the people who live there, particularly those who have a weakened immune system. 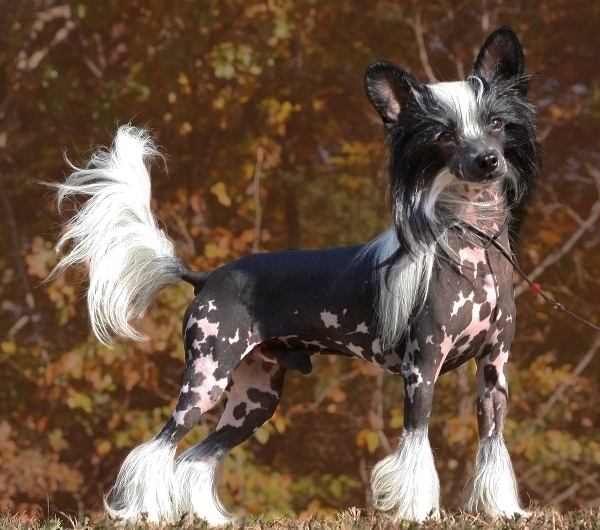 One of the most stylish and popular of the hairless dog breeds is the Chinese Crested, which comes in two distinct varieties, the Hairless and the Powderpuff. The Hairless has hair on its head (crest), feet (socks) and tail (plume) and the Powderpuff is fully coated. The Crestie comes in any color or combination of colors, requires minimal grooming and typically weigh less than 15 lbs. Their activity level is medium to high but they enjoy quiet times with their family. "Designer dogs" are not hypoallergenic, in actual fact, due to cross-breeding, it is impossible to know coat type in the adult. Only a purebred dog will have the predictable coat type and texture which may determine how well someone with asthma or allergies responds to canine company. So don’t deprive your asthmatic or allergic child of a pet. Growing up with any breed of dog could actually improve his immune system. Everyone needs a non-critical friend that really listens and loves unconditionally. Dogs do that. 86% of chronic allergies are environmentally correctable. COPD, allergies or asthma? 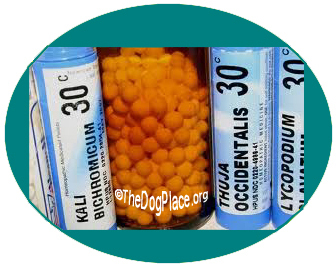 Get healing homeopathic information. Vets who dispense steroids without diagnosing CAUSE are incompetent.